Yesterday was an interesting day: Three of the book-related posts I’d written for other websites were published within a few hours of each other, giving me a lot to talk about that afternoon. “Whatcha Reading, Jennifer Weiner?” is the latest in my regular series of short interviews for inReads.com—I’d conducted a more extensive interview with Jennifer about her latest novel, Then Came You, for a Beatrice project that’s still in development, but I used a few minutes at the end to get her talking about The Kid, Sapphire’s long-awaited second novel. She does such a good job of “selling” the book that one of my friends on Twitter said that watching the video made her want to buy it and read it. And that, as I’m sure I’ve said somewhere before, constitutes a successful day as far as I’m concerned. Then there was my weekly post for USA’s Character Approved blog, focusing on Téa Obreht and her debut novel, The Tiger’s Wife. I’d been hearing great things about this book for several months, and the Orange Prize that Obreht won last month kept it on my radar, but I’d never quite found the time to read it until last week. I’m glad I did: It’s a fascinating hybrid of a novel; Obreht’s young first-person narrator describes the chaotic impact of civil war on her Eastern European homeland, but she also shares stories from her grandfather’s life that inject a welcome dose of fantasy. I found myself equally caught up in both halves of the novel, and I was delighted by how Obreht ultimately tied everything together. I’ll be looking forward to seeing what she does with her next book. 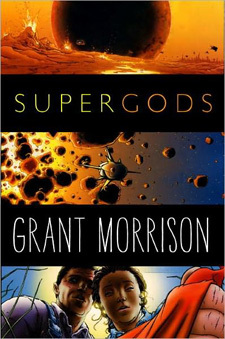 Finally, over at Tor.com, I reviewed two books about superheroes as our newest archetypes, but really only one of those books was any good: Grant Morrison’s Supergods. Of course, I have to confess that I’ve been a fan of Grant Morrison’s comic books for just over two decades now, and series like Doom Patrol and The Invisibles have become significant touchstones in my creative philosophy. So I was predisposed in some ways to like this book, which starts out as a sort of cultural history of American comic books—the comparison I draw in the review is to Greil Marcus’ Lipstick Traces—which takes on an autobiographical perspective about halfway through, and eventually works its way to Morrison’s theories about extradimensional intelligences who might view our reality in the same way that we view the world(s) depicted in comic books. But while Supergods is powerfully inspired, I did find myself wanting more in some places, especially the lost opportunity to go into detail about Morrison’s specific approach to the Batman character over the last half-decade. I’d also say that while the book is loaded with incisive descriptive analysis of comics from the first appearance of Superman right up to the present day, it feels a bit rushed at the end, as if the threads weren’t tied together quite as tightly as they could have been. Still, there’s a lot of amazing stuff crammed in there, more than I was able to fit into my review (especially since I had to spend some time on a book that got wrong nearly everything Supergods got right).